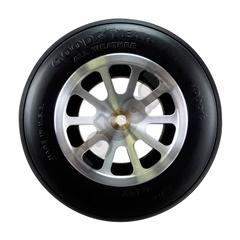 ﻿Robart Tire has a tough outer skin, softer inner core and a low bounce design. Available in sizes from 5" to 6" and are available with a machined aluminum hub with No Spoke, 8 Spoke, 10 Spoke, Scale P-51 10 Spoke, Scale D-18/C-45, 3, 4 & 5 Spoke Spitfire Hubs and P-38 6 Spoke Nose Hubs and all aluminum hubs have a replaceable bronze bearings for 1/4" Axles. 5" 1 9/16" 9.4 oz. 5 1/4" 1 9/16" 9.7 oz. 5 1/2" 1 5/8" 10.5 oz. 6" 1 13/16" 11.2 oz.